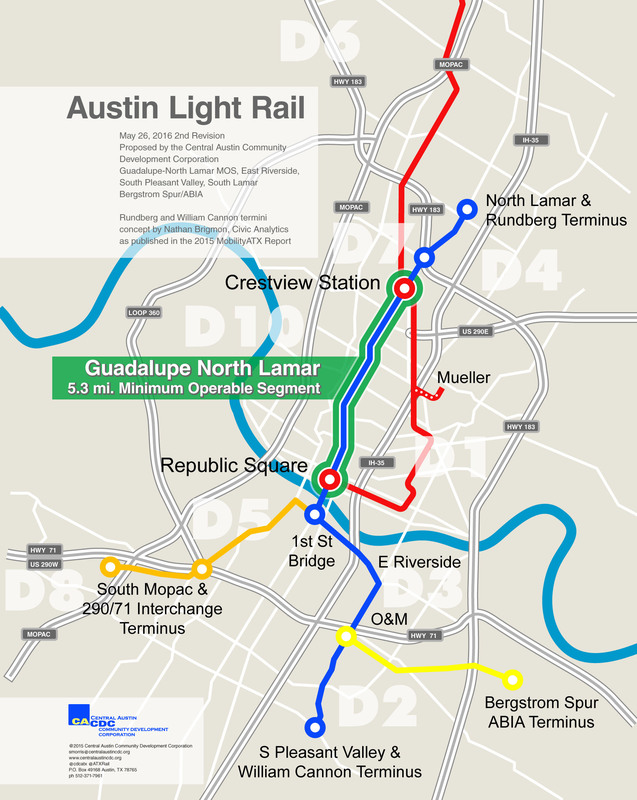 In recent weeks, within Austin’s transit advocacy community, rumors have been circulating of some kind of “package” of major transit projects possibly being compiled, perhaps for the November 2018 election cycle. 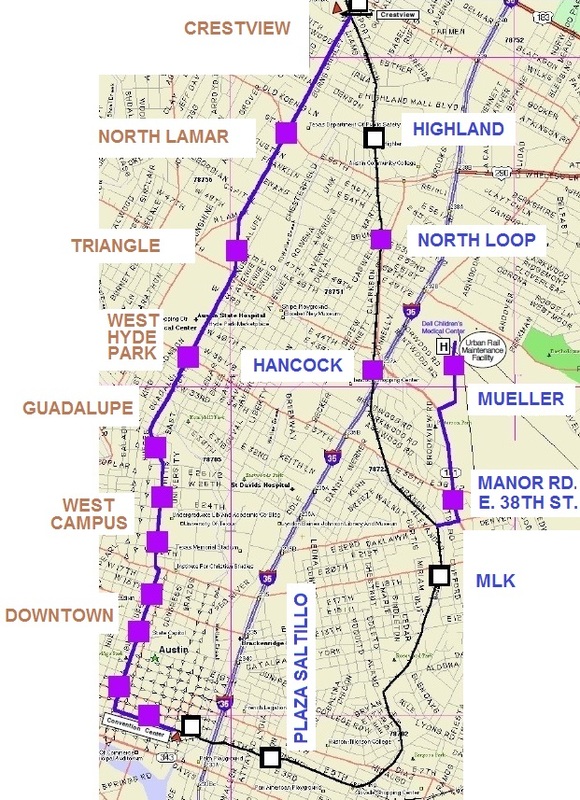 While details are murky – concocted behind the veil of a resuscitated Project Connect and the tightly shuttered enclaves of the high-level leadership consortium of Capital Metro, City of Austin, plus some Travis County and state officials – it is whispered that such a plan might include a “Guadalupe-Lamar project” as well as an expansion of the MetroRail regional railway, a highway-routed bus “rapid transit” (BRT) line, and other possible projects. 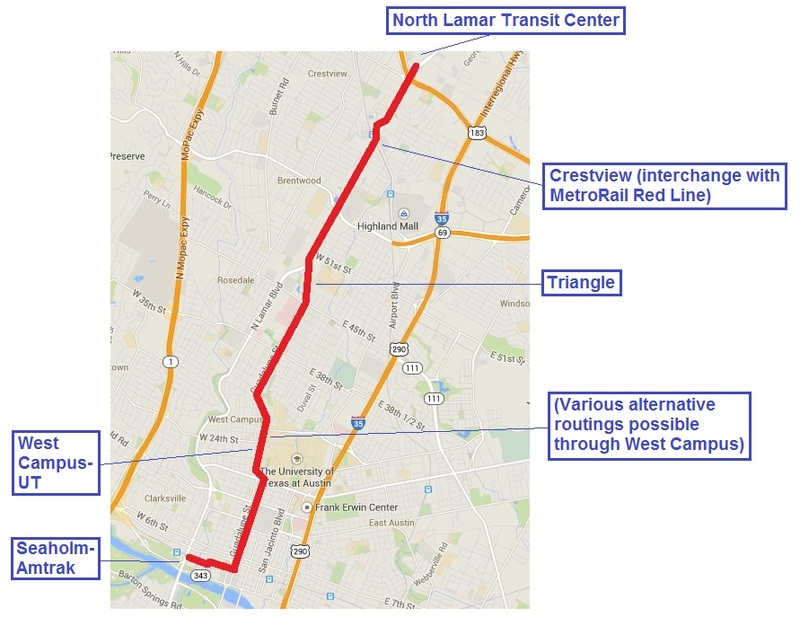 A “Guadalupe-Lamar project” sounds great – a starter light rail transit (LRT) line in the Guadalupe-Lamar (G-L) corridor would represent the crucial linchpin of an eventual LRT (urban rail) network for the entire metro area. But there’s no guarantee that LRT is the “project” behind the dark curtain. Whatever concrete details of these wisps of plans may exist seem to be closely guarded secrets. For the G-L corridor, officials, planners, and their consultants may be envisioning urban rail, or they might just as plausibly be concocting more investment in the pathetic MetroRapid faux-“BRT” operation … or a cable-gondola line … or some other scheme. The problem is that this top-level methodology of secrecy is now the routine modus operandi of most of Austin’s major public transport planning. And this, in an era of so-called “transparency”. Local planning wasn’t always this Machiavellian. Back in the early days of the Austin Transportation Study (predecessor of CAMPO) and Capital Metro, particularly in the 1970s and 1980s, planning was upfront; plans were on the table for public review, discussion, and debate. Community activists were intimately involved in the planning process; public participation was vigorous and vibrant. Meetings of advisory bodies such as Capital Metro’s Citizens Advisory Committee and Transitway Corridor Analysis Project Advisory Committee were frequent and well-attended, often by participants in the dozens. Plan proposals were not only clearly on view, but were shaped and fine-tuned by direct community input. That process has, in recent years, been squelched. Interactive public meetings have been replaced by “open houses” and “workshops” where actual full discussion among all participants is excluded. Austin Rail Now has analyzed and criticized this deleterious process in considerable detail – see the numerous articles collected in the category Public involvement process. Bona fide, free-speaking, freely attended, full public meetings are a critical component of democratic process. That’s how ideas are raised, shaped, tweaked, finalized – via discussion within groups of participants with a diversity of expertise, backgrounds, viewpoints, insights. You can be sure that these occult, mysterious transit plans we’ve been referring to have been hatched by vigorous interactive meetings … not of the public, but of a relatively tiny, cabal-like huddle of officials, planners, and consultants sheltered from public view and involvement. A carefully assembled community body like the Multimodal Community Advisory Committee is allowed an occasional glimpse of what’s already been decided elsewhere … and then, only every few months or so. 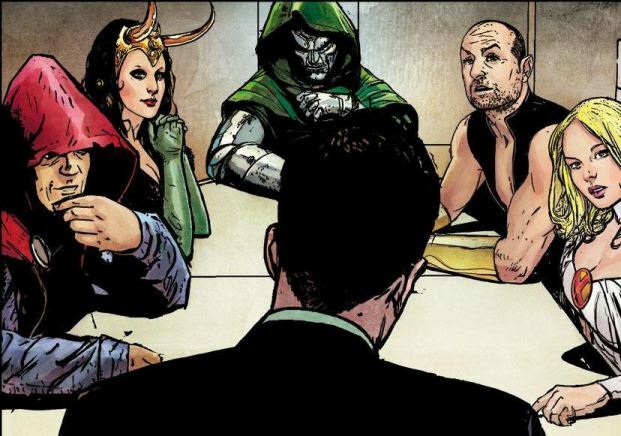 Back in the days of the directly involved and intensely active public advisory committees, meetings were held several times a month (especially in the final stages of formulating plans). Even through this dark, distorted process, perhaps acceptable plans will emerge that will be embraced by the Austin community. But don’t hold your breath. The absence of direct, intimate, ongoing, adequately engaged, fully democratic public participation seriously increases the risk of flawed outcomes and political problems.